This section provides information and help to those qualified doctors seeking to undertake specialist training in psychiatry, medical students and doctors in training considering it and for the general public. The College of Psychiatrists of Ireland (CPsychI) is responsible for all aspects of postgraduate training in psychiatry in Ireland. It aims to provide the best possible training for qualified doctors at both basic and higher ‘Specialist’ level in psychiatry. This year the College of Psychiatrists of Ireland will once again run their successful Summer School events. Organised by the Trainee Committee of the College, for this sixth consecutive year, this event is aimed at Medical Students and Interns who are interested in a career in Psychiatry or who simply want to find out more about the work Psychiatrists do. The dynamic one day programme is completely free and includes interactive seminars with Consultants and Trainees and tours of Psychiatry facilities, emphasizing both the cutting edge science aspects and psychiatric subspecialties. There is also an evening reception held following each event and ample opportunity throughout the day to informally meet with current Trainees, Consultants and other Students. The interesting and stimulating aspects of Psychiatry of which are not covered in a standard undergraduate Psychiatry placement will be highlighted. Feedback from the last number of years has been overwhelmingly positive and the College of Psychiatrists of Ireland is proud to showcase the multifaceted and varied aspects of Psychiatry. 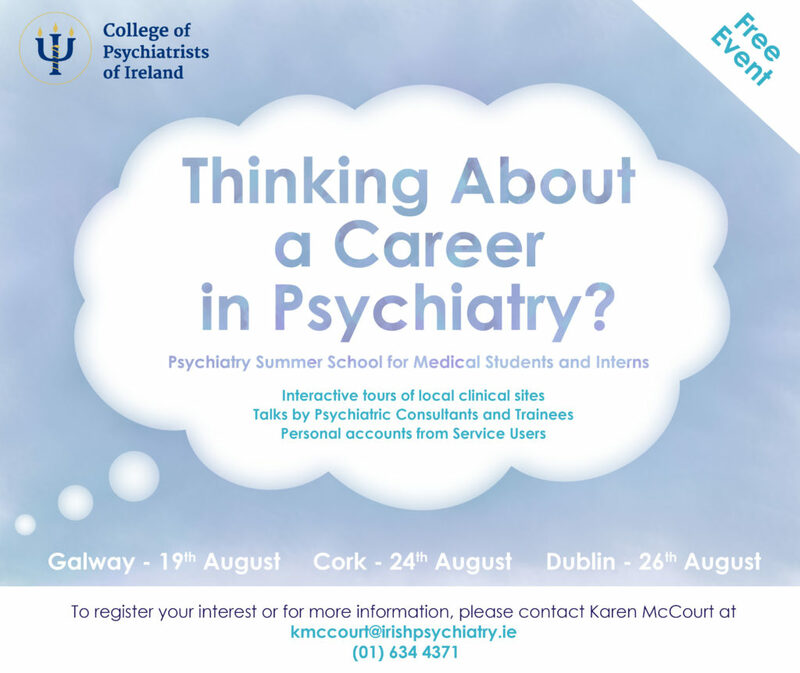 To book your place please email Ms Karen McCourt and include the following details: (i) your name, (ii) contact telephone number, (iii) University, (iv) year of study/intern position and (v) details of any previous placements in Psychiatry.